As in EA1984.60, small blue lions are set into hexagonal fields created by linked lozenges. 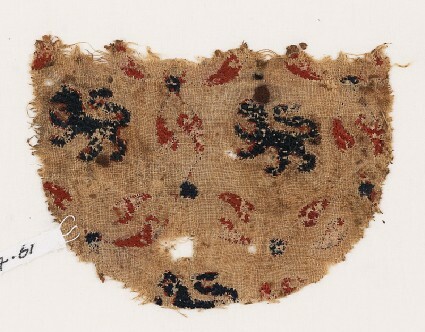 In this fragment there are three lions. It was probably part of the same original fabric as EA1984.60. There are remains of sewing thread at the top, and as the previous textile, the fragment has the shape of a small pocket or lappet. Laid threads are couched down over surface satin filling stitches. There are remains of blue outlines, possibly worked in stem stitch.